During its Maha Cashback Sale, Paytm will also offer Re 1 deals, exciting cashbacks, Golden hour price drops, and daily flash sales. Prizes worth Rs 5 lakh, including iPhone XS, Samsung LED TVs and more will also be up for grabs. 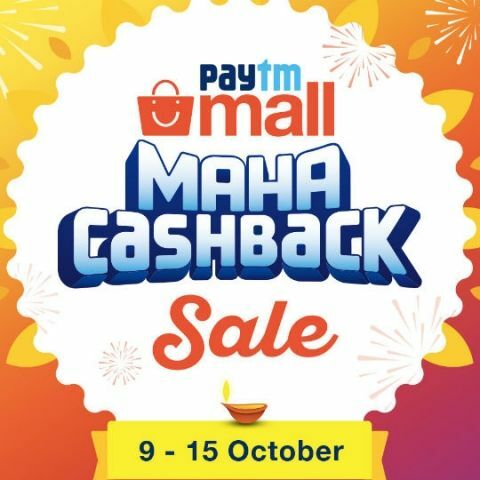 Paytm will be holding its Maha Cashback Sale on Paytm Mall from October 9 to October 15, during which the company will be offering multiple discounts, cashbacks and price drops on smartphones, laptops, cameras, bluetooth speakers, appliances and other consumer electronics. In addition, Paytm will also be hosting Re 1 deals and daily flash sales on the platform during the sale period. Shoppers will also stand a chance to win 1gm gold coins every hour on the platform, and a Renault KWID everyday, during the sale which will put up products from 5000+ brands up for grabs. Some early deals advertised by Paytm for the Maha Cashback Sale include - Rs 12,000 flat cashback on iPhone X, Rs 2,000 cashback on Vivo V7, Rs 3,000 exchange bonus on Vivo V11 Pro, Rs 3,000 exchange bonus on Oppo F9 Pro, minimum Rs 5,000 cashback on laptops and minimum Rs 2250 cashback on bluetooth speakers, Canon EOS 1300D with Rs 7,000 cashback, and more. During the week-long shopping festival, the Maha Cashback Sale on Paytm will give buyers up to Rs 10,000 cashback and No Cost EMIs on appliances like refrigerators, ACs, microwaves, mixer grinders and more, along with 2-day free deliveries. Up to Rs 10,000 cashback will also be available on various mobile phones and No Cost EMIs can be clubbed with the purchase of these handsets. Certain smart TVs will be priced under Rs 20K in the sale and monetary benefits will also be clubbed with the purchase of scooters and bikes available on the platform. Further, Paytm will host flash sales everyday from Oct 9 - Oct 15 starting at 2PM till 6PM. Users can see price drops on products from 8PM to midnight. ICICI Bank credit and debit card holders will get an additional 10% cashback on using their cards for full payments or EMI transactions. Stay tuned to Digit.in as we bring you the best deals on gadgets this festive season. Watch out for our handpicked deals starting October 9.